Finally making something from my massive ad hoc at home book by thomas keller. This book has been sitting on my shelf for over two years and I have yet to use it to make something. Mainly because each recipe that I want to make calls for a zillion steps or an extremely particular way to prepare it. 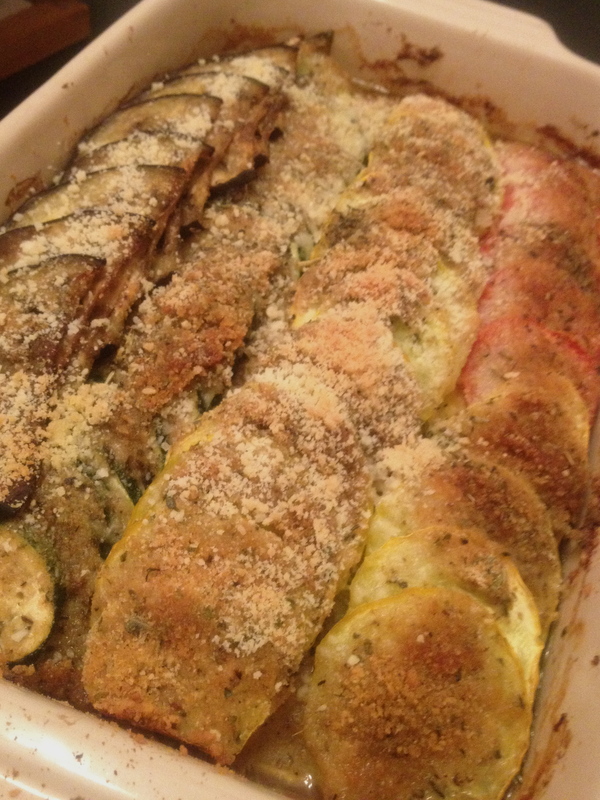 Also for the Tsai / Wang New Year’s celebration dinner, I decided to make something similar to ratatouille, or as TK would call it, summer vegetable gratin. Slice the vegetables (tomatoes, squash, zucchini, eggplant) with a mandolin to end up with slices as close in size as possible, roughly 1/4 inch thick. Use the safety guard, so you don’t end up slicing your finger like I did. Yeah, major cut numero dos. Heat the canola oil in a pan over medium heat and cook the onions and garlic until caramelized, roughly 15-20 minutes. Stir in the thyme. Combine the vegetables in a large bowl and toss with olive oil and season with salt and pepper. Combine the parmesan cheese and bread crumbs in a small bowl. Spread the onion mixture in the bottom of a 13.5 X 9.5 gratin dish. Make one row of vegetables, overlapping each other, and sprinkle 2-3 tablespoons of the cheese mixture over the top. Repeat with the remaining vegetables. 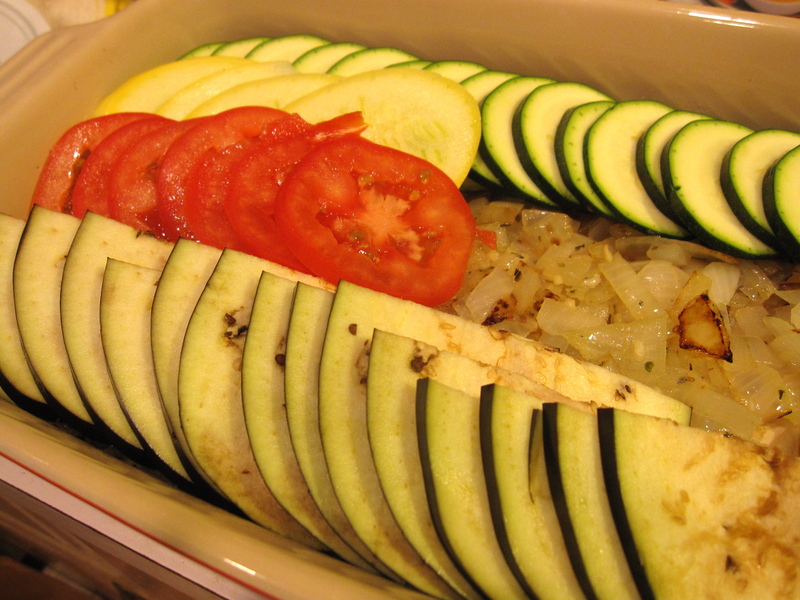 Bake for 1 to 1.5 hours at 350 degrees until the vegetables are completely tender.